Tis the seasoned dish you’ve been waiting for. 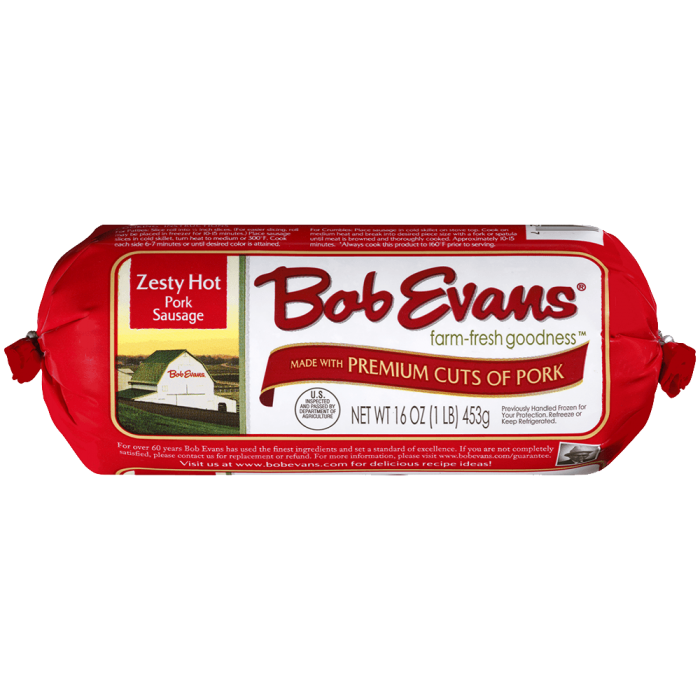 Our Zesty Hot Sausage, seasoned and spiced with crushed red pepper flakes, sage, and robust flavor make this recipe an instant classic. Remove all but the lowest oven rack. Preheat oven to 400 degrees Fahrenheit. Wrap each sugar cone in non-stick tin foil, making the foil as smooth as possible. Each cone should be able to stand upside down on it's own. Roll pizza dough out to a 12 inch x 16 inch rectangle. Cut into twelve 4 inch squares. Wrap one piece of dough around each covered cone, cutting off excess dough as needed to make a nice even edge. Set cones, so they are upright, point facing up, onto a baking sheet. Bake for 10-14 minutes, until golden brown. If the tips begin to get really brown, remove the cones from the oven, set them seam side down and continue baking. While the pizza cones are baking, crumble and brown the sausage. Remove sausage from pan, leaving just film of oil in the pan. Over medium high heat, saute green peppers until softened, add roasted red peppers and banana peppers and heat for one minute. Add sausage back into the pan along with the pasta sauce. Stir and cook until heated through. Keep over low heat until ready to use. 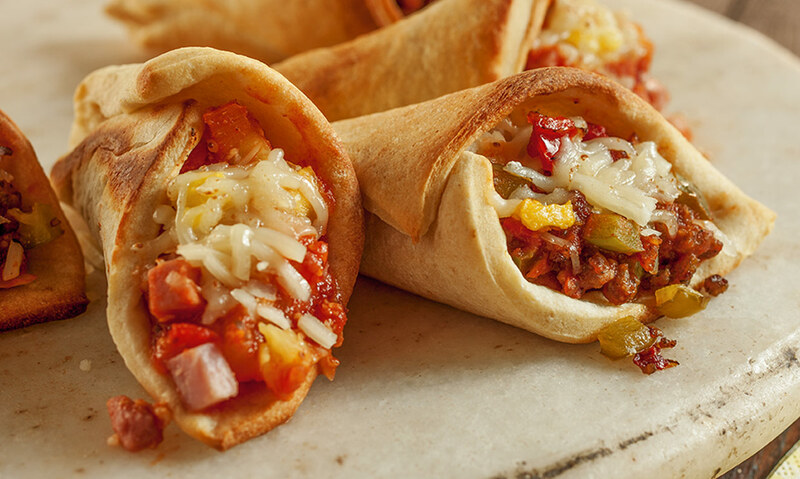 Once the pizza cones are baked and are cool enough to handle, remove them from the foil wrapped cones. Stuff about a tablespoon of cheese down into the tip of each pizza cone. Evenly divide sausage and pepper mixture and spoon into each cone. Sprinkle remaining cheese over top and allow to melt. If needed, pop in the hot oven for a minute or so. 1 Remove all but the lowest oven rack. Preheat oven to 400 degrees Fahrenheit. 2 Wrap each sugar cone in non-stick tin foil, making the foil as smooth as possible. Each cone should be able to stand upside down on it's own. 3 Roll pizza dough out to a 12 inch x 16 inch rectangle. Cut into twelve 4 inch squares. 4 Wrap one piece of dough around each covered cone, cutting off excess dough as needed to make a nice even edge. 5 Set cones, so they are upright, point facing up, onto a baking sheet. 6 Bake for 10-14 minutes, until golden brown. If the tips begin to get really brown, remove the cones from the oven, set them seam side down and continue baking. 7 While the pizza cones are baking, crumble and brown the sausage. Remove sausage from pan, leaving just film of oil in the pan. Over medium high heat, saute green peppers until softened, add roasted red peppers and banana peppers and heat for one minute. Add sausage back into the pan along with the pasta sauce. Stir and cook until heated through. Keep over low heat until ready to use. 8 Once the pizza cones are baked and are cool enough to handle, remove them from the foil wrapped cones. 9 Stuff about a tablespoon of cheese down into the tip of each pizza cone. Evenly divide sausage and pepper mixture and spoon into each cone. Sprinkle remaining cheese over top and allow to melt. If needed, pop in the hot oven for a minute or so.